We flew out at 6 am today, which means that we were driving to the airport at 4:30. The phrase “Don’t talk to me until Texas” was thrown around a couple of times. Neither Mason, Matt, nor I are fabulous morning people. I bought at Diet Coke for $3.50 in the Houston airport. I nearly wept. The house in New Orleans is beautiful. Most of the group is staying at the Monteleone hotel in the French quarter, which is gorgeous. It’s also $150 a night. We rented a charming house a mile away for much, much less. Wood floors. Writing nooks. AIR CONDITIONING. I’m working the registration table twice tomorrow, as well as going to a KaffeeKlatsch with Bruce Boston. I’m excited to do that, but I’d also love to curl up and sleep the day away, waking up to write. Sometimes I love noise and people. It distracts me. But sometimes I need to hide. Right now a little hiding would be ideal. The best part of today? We walked through the French Quarter, right up to the Mississippi river. Near the banks, I saw a Monarch Butterfly. Perhaps you know of my fondness for them. They’re very important to me. They remind me of childhood and hope and struggle. Few things are as significant. It’s the first Monarch I’ve seen of the season. Big and bright and beautiful. I actually cried, “A Monarch!” and ran after it, like I was a little girl. 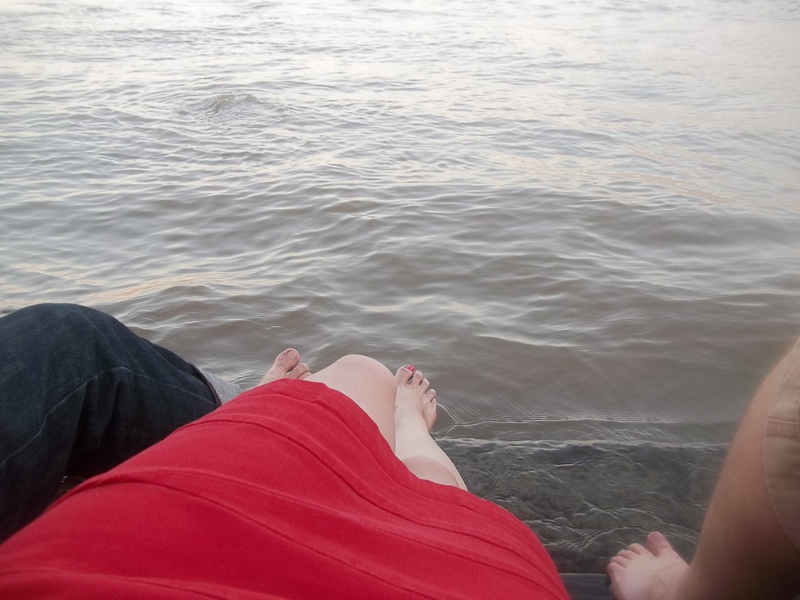 Then my friends and I went and put our feet in the water of the Mississippi. We watched the boats go by until the sun went down. I didn’t want to move. It was peace. I saw a few friendly faces and will see more tomorrow. My mind is close to home, tonight. I talked to my son on the phone and he’s excited for me to come home. My daughter told me the bunny was in the back yard today, even though I wasn’t there. I told her that animals come to play with her, too. Mercedes, I cannot believe that the Monteleone is that much for the convention. I am used to the convention rate being $75 a night. I am aghast. That being said, the houses in NOLA are wonderful. Are you in a little Creole cottage? Those are so quaint. I am so very glad that you got to spend time on the Moon Walk. It is amazing. The river is so powerful. It sounds like you had a lovely day even though it started early and the Coke in Houston was awfully expensive. OUCH! The sighting of the Monarch was a gift as the rabbit has been. I am glad that you are getting this visits that bring messages of hope. You are a rock Mercedes. I know that this is a difficult time for you I wish I could “fix” it for you. Enjoy the convention. Take time to find quiet corners to refresh and rejuvenate. There will be moments to take advantage of same. Grasp them with both hands.